I recently completed the International Trauma Life Support Course (ITLS) at IU Health Methodist Hospital in Indianapolis. It was an excellent course and I believe that any clinician interested in trauma care will benefit from it. This blog is basically my study notes and my peripheral brain. Placing my notes online makes makes them available to me anywhere. And that is because the excellent built-in search function of the content management software [WordPress] makes it easy to find my notes on any topic when I want to review them. This post contains excerpts from International Trauma Life Support For Emergency Care Providers Provider Manual, 2016*. Specifically, this post consists of excerpts from Chapter 2, Trauma Assesment And Management, pp 28 – 49.
status; made up of the ITLS Primary Survey, ITLS Ongoing Exam, and ITLS Secondary Survey. a brief exam to find immediately life-threatening conditions; made up of the scene size-up, initial assessment, and either the rapid trauma survey or the focused exam. 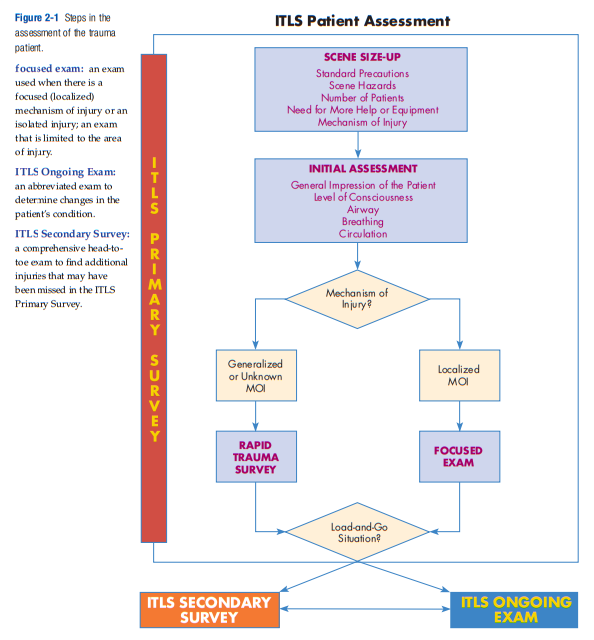 a rapid assessment of airway, breathing, and circulation to prioritize the patient and identify immediately life-threatening conditions; part of the ITLS Primary Survey. a brief exam from head to toe performed to identify life-threatening injuries. scene size-up as described in Chapter 1. Once you begin your assessment of the critical patient, you may not have time to return to the vehicle for needed equipment. For this reason, always carry essential medical equipment with you to the patient’s side. needed, delegate them to your team members while you continue the assessment. This is an important concept that immediately addresses problems encountered and yet does not interrupt the assessment sequence and does not increase scene time. Teamwork is essential to good patient outcomes. As you approach the patient, identify yourself: “My name is _____. We are here to help you. Can you tell me what happened?” The patient’s reply gives immediate information about both the status of the airway and the LOC. 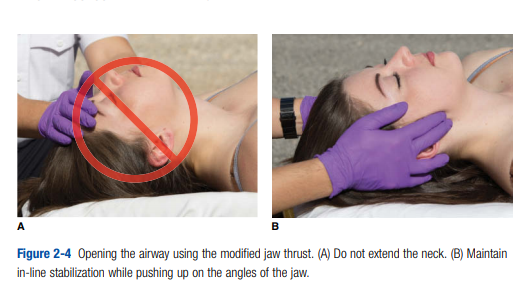 If the patient responds appropriately to questioning, it indicates the airway is open and the LOC is normal. 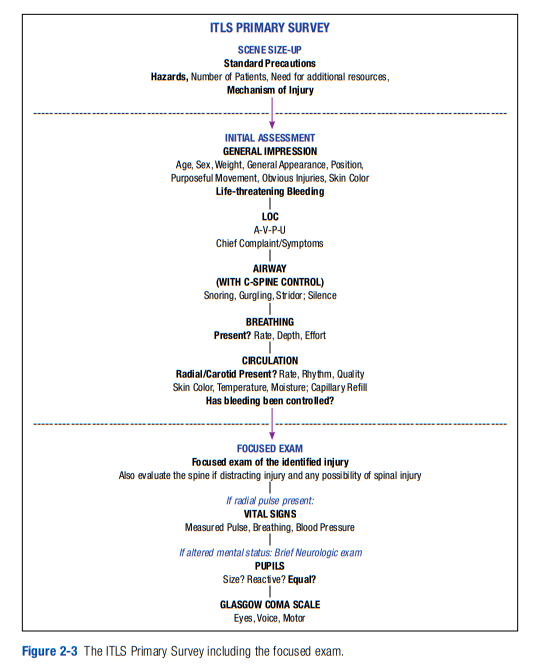 If the response is not appropriate (the patient is unconscious or awake but confused), make a mental note of the LOC using the AVPU scale (Table 2-1). Anything below “A” (alert) should trigger a systematic search for the causes of the altered mental status during the rapid trauma survey. Loss or decrease in LOC can be caused by many things, including obstructed airway, respiratory failure, shock, and increased intracranial pressure, as well as drugs or metabolic disorders. 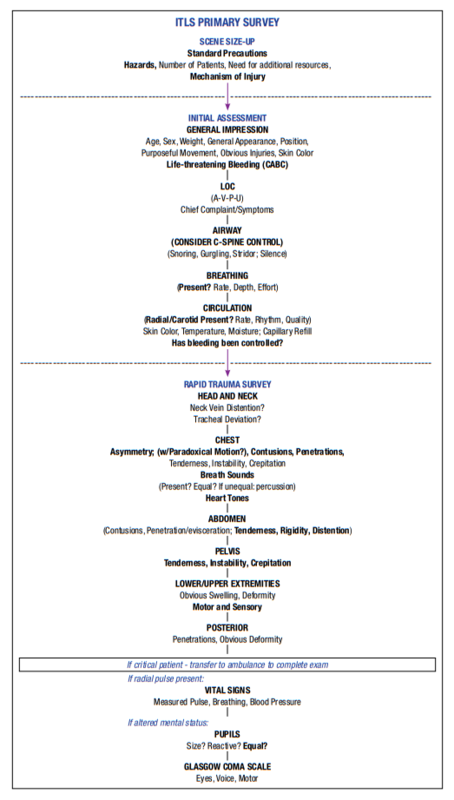 The rapid trauma survey leads you in a systematic, organized way to look for the causes of the altered LOC. 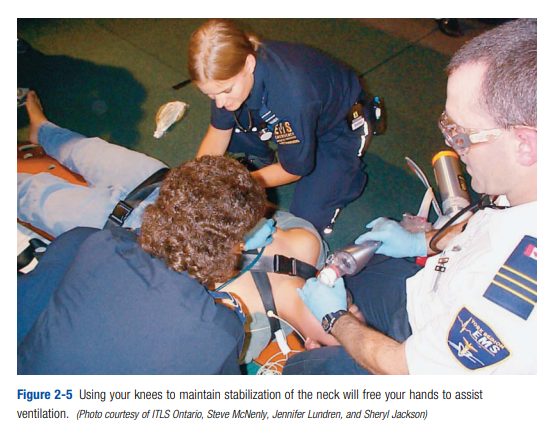 emergency care provider 2 should begin to assist ventilation immediately using his or her knees to restrict movement of the patient’s neck, which will free his hands to apply oxygen or use a bag-valve mask to assist ventilation (Figure 2-5). When assisting or providing ventilation, be sure that the patient gets an adequate ventilatory rate (one breath every six to eight seconds) and an adequate volume, as evidenced by an adequate chest rise (about 500 mL for an adult or 10 mL/kg for a child). Emergency care providers tend to ventilate too fast when using a bag-valve mask. who are breathing too fast should receive supplemental high flow oxygen. As a general rule, all patients with multiple-system trauma should receive supplemental high-flow oxygen. Several recent studies suggest that too much oxygen may be harmful, so it would be prudent to try to keep the pulse oximeter reading around 95% rather than 100%. Start here on p. 36. This entry was posted in Medical News. Bookmark the permalink.